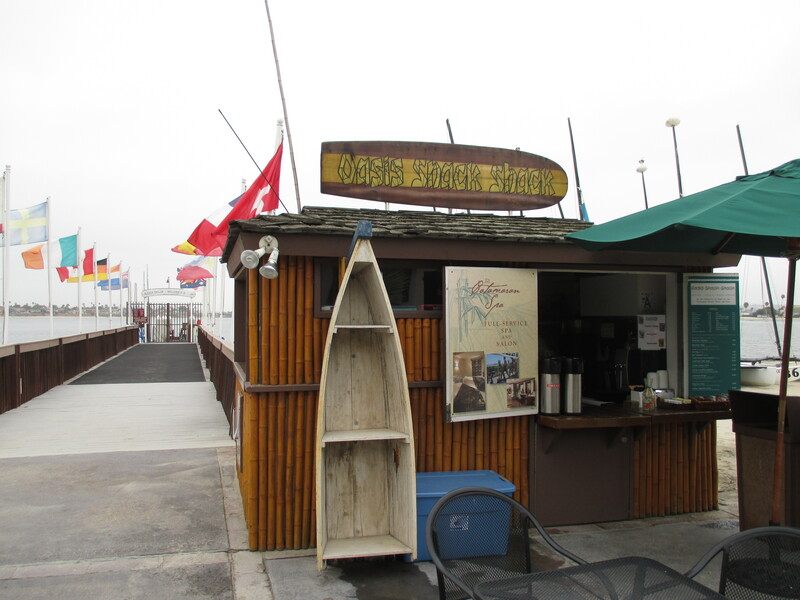 Summer season means the Oasis Snack Shack on Mission Bay at the Catamaran Hotel’s dock is open. The tiny shack serves up a great cup of Farmer Brother’s coffee for $2.00 in a paper cup. (No free or reduced price refills.) The coffee is great, but the location is what will draw you to this spot many times during the summer season. The Catamaran Hotel (http://www.catamaranresort.com) provides lounge chairs and umbrellas on the well-kept sands of their property. There are signs posted by the Catamaran stating the chairs and umbrellas are complimentary and for everyone—not just hotel guests. There are a few tables right by the shack or take your cup of coffee nearer to the hotel where there are additional tables. All feature fabulous views of our glorious Mission Bay. Sipping a coffee while enjoying beautiful Mission Bay just can’t be beat. Hang out for a while and then take a walk south to South Mission jetty or to Belmont Park. Walk along the bay or ocean boardwalk. Walk north on the ocean boardwalk and you’ll find Pacific Beach’s Crystal Pier. Your coffee morning turns into a great walk with plenty of people watching. On our most recent walk after a cup of Oasis Snack Shack coffee, we watched a skateboarding dog! The Catamaran Hotel’s ambience will remind you of Hawaii. Be sure to see the koi in their lobby. The Catamaran charges for parking, but there is usually street parking available and always plenty in the morning at coffee time. Oasis Snack Shack’s hours are 7:30AM to 3:00PM during the summer. Mark a date or two on your summer calendar for a pleasant coffee experience and walk starting and/or finishing at Oasis Snack Shack. This entry was posted in Coffee shops in San Diego, near the beach and tagged Mission Bay, Mission Beach, Pacific Beach. Bookmark the permalink.